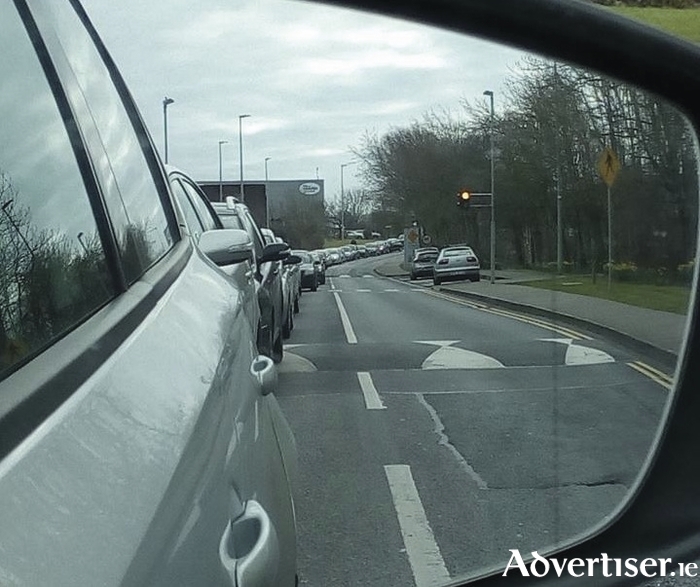 Photo of a recent tailback in the parkmore area. The traffic situation in Parkmore Business Park is “not only an inconvenience, it is dangerous”. With people “caught in their cars for over an hour”, demands are being made for the gardaí to be brought in to deal with traffic management at peak hours. Labour city councillor Niall McNelis is calling on City Hall chief executive Brendan McGrath to request the gardaí for assistance in dealing with the situation. While he acknowledged that works are in the pipeline for a new entrance, the new exit and road layout is not expected to be completed until 2017. Furthermore Cllr McNelis was critical of the absence of a traffic management plan during the original construction of the park. “It was an utter disgrace that no one thought of a traffic strategy while developing this business park,” he said. “People stuck for more than an hour outside their work place in the evening are panicking, getting anxious, and this will, and does, lead to aggression - which no one needs trying to get home in the evening. Last December, workers at Parkmore were informed that a working group had been formed “to find and drive solutions to traffic issues” at Parkmore. The Parkmore Traffic Action Group includes the Galway city and county councils, and the IDA. The notice said the IDA intended to apply for planning permission for construction of a new link road and junction to connect with an existing access road, within the park, to alleviate traffic travelling to the N17. In February, workers were informed that the IDA and Galway County Council had agreed a design for the second exit/entrance into the park, from Parkmore Road, and the formal planning application was submitted on Friday February 12. Work was expected to begin in April, however an appeal was lodged on May 4. One worker at Parkmore, Tomás Cooley, outlined the considerable delays in getting home from work, owing to the severe congestion in the area. Leaving Parkmore at 4:25pm, Mr Cooley noted how it took 30 minutes to get to the gate; 25 minutes to get from there to the T-junction on the main road; a further 25 minutes to get to the lights at Brierhill junction; followed by, and in contrast to a 25 minutes journey home to Loughrea. Mr Cooley has expressed doubts that the proposed new road will solve the current problems of congestion and he is calling on local politicians to become more proactive on the issue. In response to Mr Cooley’s criticisms, the IDA, in an email to him, admitted the situation “is unacceptable and hugely frustrating for employees”. It said the IDA is will continue to work with the Parkmore Traffic Action Group “to advance a range of measures to alleviate and solve the problem”. Sinn Féin city councillor Cathal Ó Conchúir has called the situation a “disgrace”. Her said he intends to ask the other councillors to join him in meeting with City Hall’s traffic Corps “to see if they can provide a temporary solution to the problem”. Cllr Ó Conchúir noted how most traffic lights in the city are connected to a central viewing area in City Hall, but that these are only manned during Race Week. He added that he will endavour to have personnel engaged there "during peak traffic times". Page generated in 0.1756 seconds.